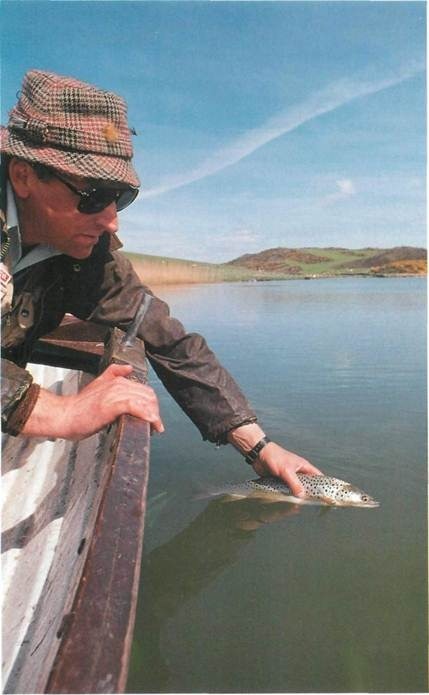 It is early spring and we join Bill on Coldingham Loch in Berwickshire, Scotland. The spring-fed loch lies 135m (450ft) above sea level and less than 360m (1200ft) from precipitous crags just west of St. Abb’s Head. Were it not for Tunlaw – a hill at the northerly end of the loch – the waters would spill over the brae and empty into the North Sea. Today the loch looks deep, full and green. Its sappy colour is the result of an early algal bloom, and Fishery Manager Dr. Ted Wise has switched on the aerator to try to clear it. On the steep, rocky east bank above the boat house, gorse is in flower, adding a splash of vivid yellow to the scene. From a fishing point of view conditions are awful. Bright light and a chill north-west- erly wind (all the way from Iceland!) make for a classic bad day. But Bill is typically cheerful as he tackles up. 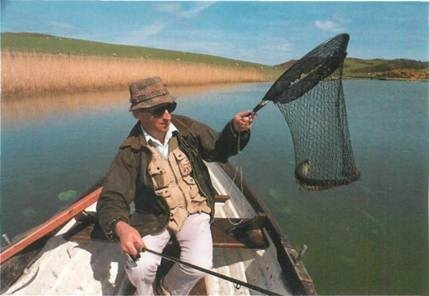 A Lancastrian, Bill fishes many stocked still waters of the North-West, including: Blencarn, Bigland Hall, Cogra Moss, Ghyll Head, Hall More and Wyresdale Lakes. 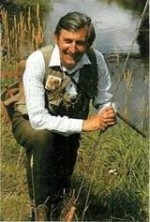 He also fishes natural lakes – especially Windermere, Coniston and Ullswater. An extensive lily bed and a fallen pine make this spot well worth a try. Here it is – Bill’s first fish of the day – a fully-finned, brightly coloured rainbow of about 0.6kg. It isn’t necessary to use a net on smaller fish – you can just pick them out by hand instead. Just before catching this rainbow Bill lost what he thought was a perch. Each season some perch are trapped from the loch. Ted Wise’s primary concern is with the running of the estate’s holiday cottages and chalets. The number of rods is limited to six from the bank and there are five boats, each taking two rods. Day tickets are available from Ted at his house. Tel. (08907)71270. 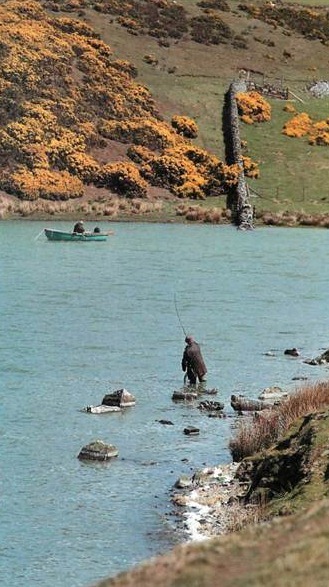 Bill puts in a few casts on the north end of the loch. The wind was fairly strong up here, making a retrieve unnecessary. The wind blew the line round in a bow and did all the work. A mid-afternoon hatch often saves the day – as it did here. Bill lands the first of several brownies taken from the north end. The colouring and size of the browns are purely dependent upon what the fish eat and their physical location within the fishery. At Coldingham the brownies come in two colours: with a creamy belly or butter-yellow one. Both have large distinct spots. For this type of fishing he favours a long rod of (3.4m) and AFTMA rated no.6- 8, a no.7 floating, non-stretch line and a team of three flies. Bill makes his first cast by the boathouse -where there is a landing stage. 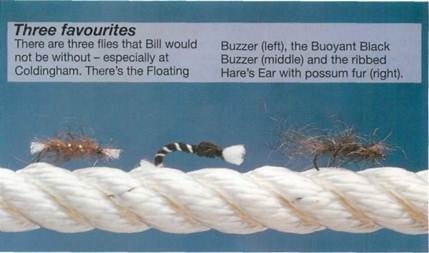 The fish can be found at all levels and it is with this in mind that Bill chooses his team of flies. 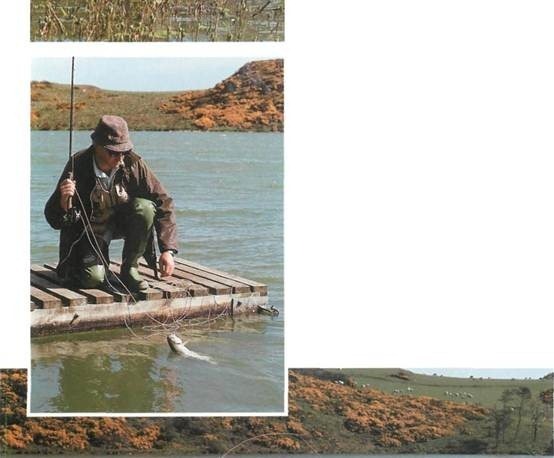 His own variation of a lightly leaded Hare’s Ear – tied on a size 10 and fished on the point – drags the middle dropper slowly into the pea-green water. The leaded fly is used to search out the lower layers. A Floating Buzzer variation (on a size 12) covers the mid-water region and a Buoyant Pheasant Tail Buzzer variation (on a size 12) hangs in the surface layer. Although Bill describes his approach as ‘imitative’, this is really to contrast it with lure fishing methods which other anglers use (often slavishly). Suggestion, rather than exact imitation, is perhaps a more accurate description. For example, the Hare’s Ear imitates nothing in particular but is suggestive of aquatic creatures such as shrimps and various nymphs. The trick is to make it behave ‘as the natural’. Bill inches the flies back, waiting until the leader has sunk fully and the tip of the line started to go down before re-casting, letting the team sink and retrieving again — watching the line all the while for plucks and twitches. It soon becomes apparent, though, that the first fish is not going to come from the landing stage – so Bill moves on. On the west bank of Boathouse Bay a pine wood slopes steeply down to the water. Here and there, between patches of crisp, brown bracken, little clusters of pale yellow primroses and pink campion show. In the loch margins -just beneath the water’s surface – wrinkled lily pads strain to reach the sunlight and unfurl. Although Bill has put a lighter leaded fly on the point, once or twice the rod takes on a lifeless bend as a hook finds the lily pads. Then – almost miraculously – it arches over, bucks and shudders as a fish zips and darts for cover. 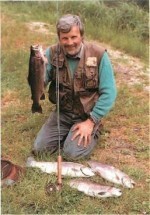 Soon a rainbow of about (0.6kg) is lifted from the water. (It took a liking to the Hare’s Ear.) 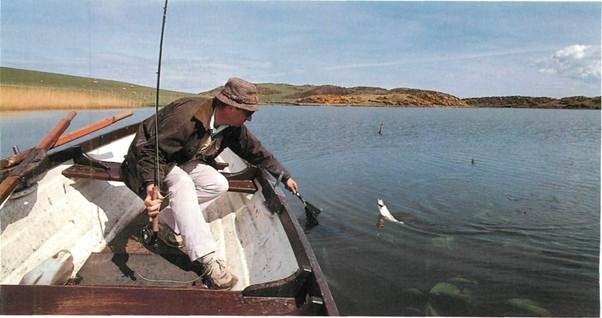 Bill rarely keeps fish unless they are for someone else, so he carefully unhooks it and returns it gently to the loch. 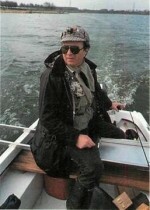 Bill’s method for spotting takes is similar to the coarse angler’s technique of swingtip-ping. Beyond the rod tip the first 15cm (6in) of line hangs vertically and a take is signalled by a sharp, but often slight, lift of the line. He’s right too. Here’s one now – another rainbow judging from the way the rod is shivering. It makes several fine leaps but Bill kneels and plays it patiently to a standstill before guiding it to the edge of the pontoon and lifting it carefully out. It’s another rainbow – about lKilb (0.6kg) – and unusually tatty for the water. ‘It’s rare to catch even a recently stocked fish that isn’t fin-perfect,’ says Bill as he removes the standard Black Buzzer. In spite of having good vibes about the northerly end of the loch, it doesn’t produce and Bill retraces his steps, pausing for a short while at the fallen pine for a few casts before moving on to the rugged south bank of Swing Gate Bay. He works his way gradually along the bank, trying different flies and flailing his line into the facing wind – but all to no avail. It’s simply too bright and cold. The only answer is to break for a fish and chip lunch in Coldingham. After a fine repast Bill has taken a glass-fibre boat and is burning off the calories by rowing steadily towards the north end of the loch. At the far end is a bed of thick reeds which acts as a windbreak — creating the only patch of sheltered water on the whole loch. He has one of his own creations on the point – palmered from head to tail so that its bushy body bites slightly into the water surface. On the middle dropper there’s a Solwick variation and on the top dropper a fly which came to be called the ‘Right Wally’ ( for no better reason than that it had to be called something). Bill uses Gink (floatant) on the point and middle droppers. He puts the drogue down and tries a couple of drifts down the northerly arm, casting and stripping back the line fairly fast while watching the top fly. But there is no sign of a fish – not a sausage! But then, at the top end – right against the reeds, over the sub-surface lilies -Bill spots a swirl, then another and another and another – suddenly it’s alive with fish! But are they trout? Only one way to find out – off come the palmers and on go a variant on a Shipman’s Buzzer, a Buoyant Buzzer pupa and a tiny Black Buzzer. A tidy cast puts the team over a rise and wallop! – Bill is in. After a good solid, rod-thumping fight a brownie of about 1lb (0.7kg) is lifted into the boat. The waters are so alive with the hatch that Bill’s flies are landing on flies. A fish just misses the pupa, then there’s a swirl and a splash and another brownie dives for the pads. It just goes to show that perseverance pays in the end. that October chill. 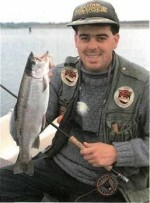 Mickey gears up with a 10ft (3m) fly rod rated AFTM 10. He couples this with a 10 weight Hi-density shooting head line and a 3m (10ft) leader of 10lb (4.5kg) clear mono. On the point goes his bread and butter – a lavishly tied Booby with large, bulbous Plastazote eyes which make the lure wiggle its marabou tail alluringly in the water.